Yesterday, BunkerSofa attended that Twitter Japan party in Harajuku. - Micro-blogging: people write short sentences about what they are doing and thinking. - Real-time communication: what i call interrupted chat. - Timeline: you get historical data on your own behavior and thought process. 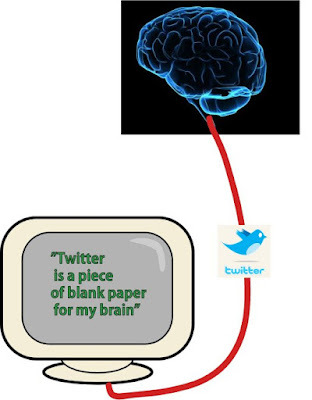 - Brain-to-brain connection: Twitter is the first step towards a network of brains. - Questions-answering: To get information, instead of typing keywords in Google, you can ask directly human beings. - Trends analysis: you can get a precise idea of what's happening on the Internet at a specific instant. But I think I have recently got another interpretation, which is more powerful, encompassing all the previous ones. In fact, I think it 's a fundamental one. As you know, a computer runs a binary software and computes something. The result of that computation is usually printed out on the screen. The human brain is the same. It s an electrochemical calculator, running a special kind of software, a neuronal software called "thinking". The result of that computational process is a thought. There is no difference between an electronic calculator and an electrochemical calculator: in both cases, you wanna print out the results of the computation. (*) If you have other interpretations, please comment! I may agree with most of the things you wrote. But I dont think it is the first step to brain-to-brain connection. IRC or QSD (Which I used at the late 80s!) provided and still provides the brain-to-brain in one-to-one or one-to-many relationship. You could find there new information, share ideas, state what you are doing, choose different groups or channels you want to participate in etc. What twitter is doing imho is utilizing the current available infrastrctures and technlogies to provide what I wrote above to the masses, while back in the days, the number of people that had access to the net was very limited. We, for example, used to access those chat systems by either hacking into educational institutes and using their unix based platform to run the irc's or hacking into the main communication hub of the single carrier at that time and creating a tunnel to the outside world on their expenses - obviously, it is not a conventional way and was not accessible to the common person. I use, I do appreciate and like Twitter, but I dont think it is very innovative. I believe it is the NEXT step in brain-to-brain. twitter is certainly not the first tool to communicate in real time with another person. But the difference is that your can get (if you have a lot of followings) thousands of new status updates within one minute. It is the principle of information dispatching. No, there is a fundamental difference between twitter and irc or other services you mentioned;Of course. That is the following: you plug or unplug your brain to a specific somebody else's brain and you can chose the plug to be either in "receiver" or "emitter" mode or both. It becomes a linguistically encoded information once it is processed by your brain.